Unlike historical piecemeal approaches to integrating technology, iSchool Campus delivers the holistic Smart School, including engaging, interactive and ongoing professional development to educators. We work closely with teachers throughout the deployment process and then provide ongoing support to ensure they are comfortable and confident working within the SmartSchool environment. iSchool Campus’ efficient blended-learning model helps educators approach learning and student achievement in transformative ways. We understand and advance student learning by introducing the latest tools available that enrich curricula, and we coach educators in teaching essential 21st century skills within the SmartSchool environment, including: collaboration, critical thinking and problem solving, communication, creativity, and character. 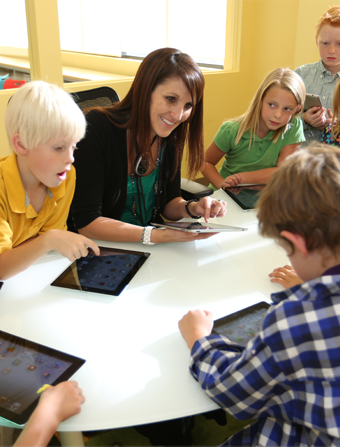 In every deployment, iSchool Campus specifically addresses the individual needs in each segment of the school system. Administrators, teachers, students, IT administrators, and parents are given comprehensive training and resources to successfully adopt and optimize the new technology. Administrators are provided with tools and resources for operating in a technologically dense environment including documentation and even 24/7 support for policies and procedures covering accidental damage, Internet security, network policies, analytics, communications, and management. Administrators are also equipped and trained in all applicable aspects of technology use and Internet control and monitoring. Teachers gain mastery over technology and achieve total curriculum and lesson plan integration, as well as access to a global database of resources including apps, websites, video content, images, and online universities. From integration with their students’ tablets and software to HD monitors and surround sound audio that empowers their presence, teachers depend on iSchool Campus’ for total control over their SmartSchool classroom. Students receive one-to-one deployment of the most advanced tablets and engaging educational software available, extending their school day and providing content and curricula anywhere in the world. They also receive technology training, support documentation, as well as access to online and phone support, as needed. IT Administrators are given everything they need to ensure that their SmartSchool technology works every time…all the time. Thorough instruction on each aspect of the iSchool Campus deployment, technical administrators are given one-on-one training to ensure their familiarity with filtering, routing, networking, configuring and maintaining the entire system — all backed up by 24/7 support. Parents have access to the iSchool Campus dedicated helpline as well as access to all training and applicable support materials provided to the school. Each school can arrange for additional training sessions and other classes involving technology development, and administrators and teachers can grant parents as much interactive involvement and monitoring as desired. To access our professional development materials, please login to the Library.